If you’ve ever spent countless hours at night scrolling through eBay and Craigslist ads looking for the most obscure you could buy you probably scrolled past every mid-80s Chevy Camaro without a second thought—and likely for a good reason. But, if you have some cash burning a hole in your pocket and a mid-80s Camaro is your dream car, do we have a find for you. An eBay listing, discovered by Road & Track, has the most 80s Camaro ever—a 1987 Chevrolet Camaro Z28 IROC-Z. However, it is the sunset paint scheme by artist Pete Santini, which is all original, that helps the coupe stand out from the crowd. The ad says the car’s been in a Southern California garage for nearly 30 years. After it was purchased new, the owner took the Chevrolet Camaro to a suspension shop where the ride height was lowered by approximately one inch. After that, the owner got a high-end stereo installed. The current owner bought the car from the original owner in February of this year. After it was purchased, the new owner had the Camaro thoroughly inspected, replacing numerous parts. Having a car sit for nearly 30 years leads to some degradation. Replaced parts include seals, bushings, fluids, fuel tank and pump, distributor cap, brakes, spark plugs, transmission tail house seals and pan gaskets, front and rear sway bar bushings, power antennas mast, and the in-dash heater core assembly. Under the hood is a 5.0-liter V8 engine paired with an automatic transmission, which is sending power to the rear wheels. A manual is almost always more fun, but an automatic is fine for this cruiser. Other features include a power trunk release, power windows, and power locks. The Chevrolet Camaro is immaculate inside and out. The ad says that after a careful inspection only one paint chip was found. Right now, the price is $24,600 to buy now, or you can make your best offer. 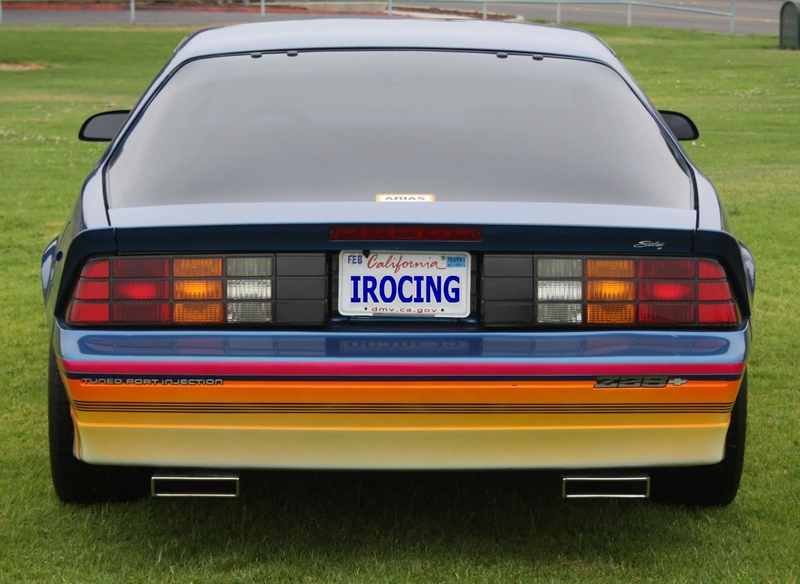 Either way, if you’ve ever wanted to relive the 1980s and attend your regional Redwood event, this 1987 Chevrolet Camaro and its Santini sunset graphic is the embodiment of the era. Any recommendations on how to restore my mullet to round out the package? Now where is my “Toto” and “Night Ranger” 8-Track tapes…………..